“Lies’ Device” was produced, mixed and mastered by Alessio Lucatti, known from his work with VISION DIVINE and ETHERNA. His brother plays an instrumental role on this album, as does ETHERNA’s vocalist Andrea Racco, offering some raw vocals. It all starts with “The Lost Mariner”: keyboards at first, but it doesn’t take long before firm rocking music comes out of the speakers. All the while the keyboards remain operating from the back. Nicoletta’s clean and soft voice goes pretty well with this kind of music. The tempo drops a little in the bridge, but is picked up again in the chorus (Power Metal by the book), where the band keeps it catchy. As a way to return to the verses, the intro theme was an easy and classic choice. Another drop in tempo occurs in the solo part. Afterwards all returns to normal and ends like it began. All in all, a very good start. “Hiding From the Sun” is misleading in the beginning: the guitar part indicates a slow song, even if the keyboards join to play the same melody. Once the verses are due, the Metal goes into galloping mode with the keyboards again providing atmospheric support. The chorus adds a more Poppy touch to the song, but doubling Nicoletta’s singing does help to give it more appeal. Another qualitative song here. For “Dollhouse (Labyrinth of Thoughts)” the band chose a somewhat mysterious sounding intro: music box-like. Melodic power kicks in pretty rapidly, during which the keyboards take the lead, the guitar adds power bursts and the drums just keep on playing a simple pattern. The verses are pretty relaxed; as a result, the singing is lower, calmer. Again the chorus is where the singing is layered, at least in the first instance. The keyboards move to the front via accents in the second part of the chorus. I had to think a little of POWERWOLF during the bridging music, i.e. before the next round of verses. Another band that came to mind in this song was IVAN MIHALJEVIC & SIDE EFFECTS. The guitar solo was ok, nothing fancy, nothing wild. And to be honest, the song didn’t require anything fance. “Reign of Kalidia” takes a direct start, albeit with a mysterious/dark edge via the combo guitar-keyboards. Power comes again from the guitars and drums, in bursts, while the keyboards handle atmospheric responsabilities. The clean singing is ok, but it could use more power in a like song like this one. The chorus is where the music pounds, while the layered singing and keyboards provide melodic fullness. A little wah-wah solo is added later to round things off. “Harbinger of Serenity” could have been a good song, an attractive song, but somehow it failed to deliver. Keyboards put out a jumpy melody in the beginning, while the guitars and drums again provide countering bursts. After the previous tracks, it’s a little awkward to slow down here. No speedy/ier Metal here at all, despite the promising intro. Andrea Rocca’s raw/screamy vocals are good in the context of the song, and the music goes well with it (or vice versa): dark, threatening organ in the back, pounding music, … add those vocals and it reminds a bit of REBELLION, the German Heavy/Power Metal band. The chorus is slow, too, and has a duet in its first half, which is nice. Again, pump it up a little more, so to speak, and I think this song will be more attractive. But as with many things: de gustibus et coloribus non disputandum. The situation improves again with “Black Magic”. Catchy keyboard melodies to begin with, transcending into a typical Power Metal track. Firm verses, layered vocals and the backing keyboards. The band shifts into a higher gear in the chorus, galloping in its second half. An slow, instrumental bridge paves the way for the uptempo solo part: keyboards and guitar taking turns. After that, it’s back to business and rounding it all off with the intro theme. “Shadow Will be Gone” is a power ballad: not bad, but not really super either, in my humble opinion. The title track needs not much explanation, as the band made a video clip for it. It’s a firm Power Metal track, with full power in the chorus. Good stuff! “Winged Lords” is a midtempo song with atmospheric verses (devoid of guitar work) at first, then in uptempo Metal mode the second time. The music slows down in the bridge and chorus. This song doesn’t stand out from the others, because it’s very similar to one of the previous ones. In addition, slowing down isn’t always necessary, not when you’re on a roll. Last but certainly not least: “In Black and White”. The music sounds happy/ier, I find, both melodically (leading part for the keyboards, obviously) and rhythmically. Full power and volume are reserved for the chorus. This review is long overdue, I know. But better late than not, right? Melody is key for this band, and keeping the material catchy. Nicoletta does a good job, but sometimes (depending on the song) it could be better to have a more rough voice to keep up with the roughness of the music. 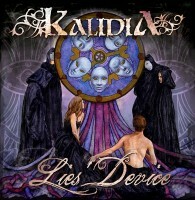 In any case, despite a few issues, KALIDIA have delivered a very promising debut album with”Lies’ Device”.